Who hasn't seen these tall plants with balls of flowers? If you break the leaf or the stem, a milky substance will ooze out. Yep, that's why it's called milkweed. You can find several species of milkweed in prairies. 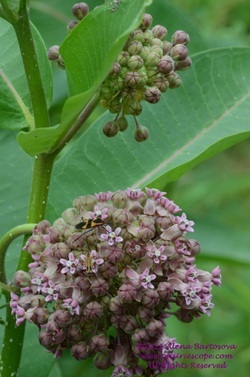 The pictures here show common milkweed (Asclepias syriaca) with pink to purple flowers and large oval leaves. After the bloom, seepods are formed -- they look almost like a pickling cucumber. Green color later changes to dark brown or black as the seedpod dries, hardens, and eventually cracks open to release fluffy white seeds. The seeds are actually brown and the attached soft white hair helps them fly, spreading milkweed seeds with wind. Orange flowers of Butterfly Milkweed at Windfall Prairie (Danville, IL). Swamp Milkweed at Meadowbrook Park (Urbana, IL). Note the narrow pointy leaves.